Caps. Structured 100% SportecTM. Contrast piping on cap. Contrast stitching detail on peak. Self coloured embroidered eyelets and fabric button. Velcro back strap with elastic loop - Black. Sporte Device printed inside tape. 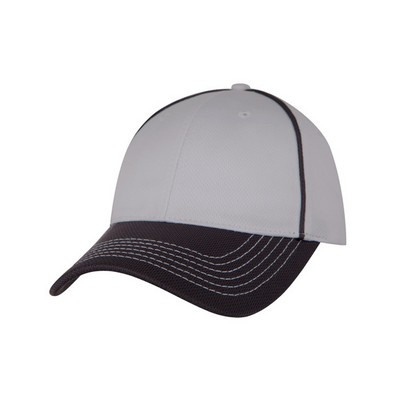 This cap incorporates all the technical properties of our popular performance polos.The lightweight mesh fabrication offers additional airflow and its moisture wicking attributes helps you stay dry and comfortable in all Aussie conditions. Materials: 100% Polyester. Decoration Options: Embroidery, Screen Print, Heat Transfer, Sporte Leisure offers in-house embroidery, Digitising & custom make. Colours: WHITE/CHARCOAL | NAVY/WHITE | HARBOUR/NAVY | RED/BLACK | CHROME/BLACK | WHITE/ELECTRIC. Sizes: OSFM.